Evolve Communities is a majority Indigenous-owned cultural awareness training organisation with a bold vision to build culturally competent, aware workforces through programs run by respected and accredited Indigenous facilitators who love sharing their cultures and learning from others. Our tailored and immersive experiences are designed by experts to create an enduring impact on your organisation by giving your teams lasting confidence, self-awareness and new skills, many of which are based on Wisdom of the Elders and cultural practices. The solutions we offer include the 3R Culture™ model (Reflect, Relate, Reconcile) and the Songlines Engaging Pathways™ approach. Since 2005, our work has taken us around Australia running programs for businesses and government departments. 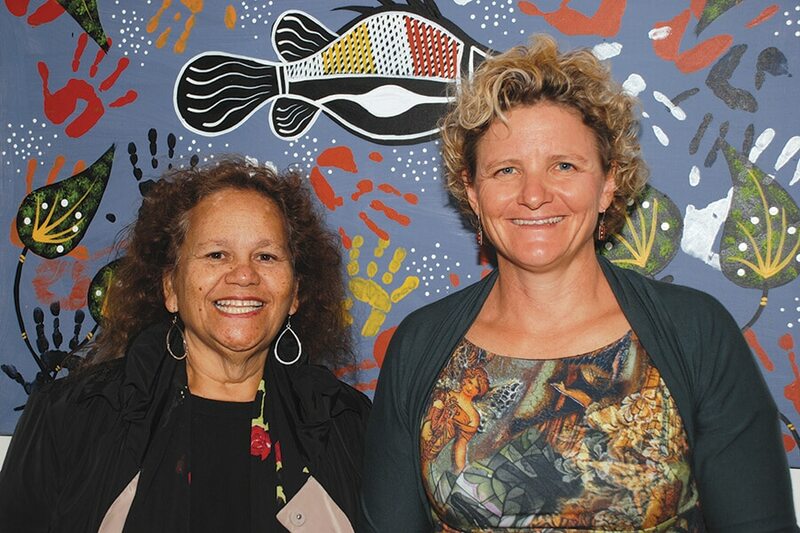 We have trained over 62 organisations and 4363 people in Indigenous cultural awareness. Munya Andrews is a Bardi woman originally from the Kimberley region of Western Australia. Despite a socially disadvantaged background and not speaking for the first five years of her life, Munya has been an accomplished and influential voice for her community. As a public speaker, she is much sought after in Australia and abroad. Educated in Australia and the USA, Munya has degrees in anthropology and law. She has practised law in Victoria and New South Wales as a solicitor and barrister, including as a legal academic at the University of Melbourne and at Southern Cross University, teaching Indigenous legal subjects. Munya is equally well-versed in traditional laws, customs and practices. Like many Aboriginal people, Munya has learned to work and live in two worlds. Her dream is to bring them closer together, and cultural awareness is an invaluable tool in the process. “There’s only one Munya.” — Justice Peter Gray of the Federal Court of Australia. When most of her friends were having their gap year in Europe, Carla set off for the remote Kimberley, followed a longstanding desire to learn from our First Nations people. That’s a journey she’s still on, first taking it further through a Churchill Fellowship, which led to her founding Evolve in 2005, and then joining forces with Munya in 2011 to focus on closing the gap between black and white Australia. Laying wisdom of the Elders over a world-class facilitation framework has resulted in award-winning solutions like the Meeting Marketplace, the R3 Culture™ model and the Songlines Engaging Pathways™ approach, the latter developed with Munya. A highly-respected program designer and facilitator, Carla makes sure that participants at Evolve’s training sessions don’t just leave more aware (of other cultures and of themselves). She makes sure they go back to work ready to use time-tested leadership and communication skills that have never been more needed. Before establishing Evolve Communities, Carla worked in Senior Positions in local and state government. Evolve has a rigorous accreditation program for our trainers who are based across Australia. They delight in sharing their cultures and learning about other cultures.